Jihadi Novels: Same Story, Different Medium, Wave of the Future? In reading “A Guest on This Earth: Humam al-Balawi and the Birth of Jihadist Fiction” by Nadav Samin, the content struck me as both contemporary and historical. On one hand, the subject of the story, doctor and author turned suicide bomber, Humam al-Balawi is now known as a trailblazer likely to be the first to pen a jihadi novel titled “Take Me to Jihad,” written and posted online in 2006. On the other, his tribal background holds Bedouin heritage, which makes his storytelling on paper only original in its medium, written in a similar fashion as some of the oral lamentations from Bedouins of past generations. Not knowing the story of the man, I only knew of the horrific act he performed at FOB Chapman, which killed 7 CIA operatives on 30 December 2009. It is familiar territory, in fact, I have been to the region multiple times, both before and after the attack. I typically do not dwell on the life of a suicide bomber, however, al-Balawi’s story is an informative one for several reasons, including being linked to authoring what is considered the first jihadi novel. His story is familiar to many others of his generation who have gone on to join the effort of the Salafi-Jihadism movement in the wake of the attacks on September 11th, 2001. Like his background as a doctor, al-Balawi’s novel protagonist is an engineer, mirroring his own upbringing and status as a middle class professional. His socio-economic status confirms a widely-known fact; jihadists do not only come from lower class backgrounds as many expect. In fact, since “the events of post-9/11 and the Iraq war, radicalization [occurring] in Western countries suggest that better economic chances . . . no longer suffice to prevent it and that the movement has now found its own momentum and draws its resources from new channels.” These new channels and outlets are mostly found online. While al-Balawi does not draw specific conclusions on why the main character radicalizes, it is undeniable religion and ideology is at the forefront of the story, specifically Salafism, for both the novelist and his character. While many try to explain away the effects of religion on modern society and tend to focus only on class, race, and gender, data and statistics “suggest ideology matters.” Adherents of Salafism and other “Radical Islamist movements share a large majority of their fundamental ideological tenets . . . including nostalgia for a lost past, a focus on tradition, a preference for order and hierarchy, and an obsession with rigid identity boundaries.” This coincides with many of the Salafist tenets including trying to emulate their lives and behavior after the “pious ancestors” and bringing back the “pure” version of Islam which is both strict and exclusive. This ideology inspired al-Balawi to act. Likely reflected in his novel’s character, Humam al-Balawi’s greatest fear in life was dying old in his bed “like a mangy camel.” This conjures up the legend and fear of the Bedouin lifestyle and warrior spirit, of which al-Balawi’s family, based on his surname, draws its lineage as part of the formerly nomadic Badi tribe. His concern is also reflected in Bedouin folklore and poetry, which believed a warrior’s death in battle was the greatest honor. In Abdulaziz H. Al Fahad’s chapter, “Raiders and Traders: A Poet’s Lament on the End of the Bedouin Heroic Age,” he writes of an old “desert knight” named Dghaylib bin Khnaysir, a Bedouin from the Asa’ida clan whose biggest fear was “dying in bed ‘like an old lady.’” Ironically, like Ja’far, al-Balawi’s character, Dghaylib tried living out his days as a nomadic warrior, raiding and pillaging, until the state and its authority no longer tolerated such behavior. Like Ja’far being prevented from traveling to wage jihad by the government, the Saudi state eventually forced Dghaylib to live a sedentary life amongst the hadaris, or “settlers.” He died an “ignominious” death, as he feared, in bed rather than what he believed should come naturally for his warrior tradition “with a blow of the sword.” Unlike Ja’far and Dghaylib, by becoming a suicide bomber, Humam al-Balawi persisted and died for the cause he believed in. Al-Balawi’s novel captures both the contemporary movement of global jihadism, specifically of the Salafist strain, and draws on historical context, both from religious text and from the traditions and culture of the region. In the modern era of globalization, al-Balawi joins a radical counter-culture, leaving behind his family, his profession, and his comfortable lifestyle. His actions prove he “ultimately renounced such ties with twenty-first century globalized normalcy and embraced a new, religiously defined version of globalism . . . one that replaced faith in markets with faith in the universality of scriptural revelation.” Like many radicalized today, it was the Internet that drew al-Balawi to wage jihad. Jihadi propaganda and information operations are not going away anytime soon. While likely to morph as they have in the past, from long videos and chat rooms to tweets and encrypted apps, they are a mainstay of the global jihad movement. In the past three years, the Islamic State proved to be the most formidable foe in the Salafi-Jihadist ideology to harness the power of the Internet and use it as a key recruitment tool capable of appealing to a wide range of adherents, including tens of thousands of Westerners. Humam al-Balawi’s novel will likely be only the first of many to come. With a massive conglomeration of foreign fighters likely to be scattered in the coming months with the fall of Raqqa and Mosul, there will be other “Vince Flynn” jihadis likely to follow in al-Balawi’s footsteps. They will find time to not only write poetry, memoirs, and religious publications, but also novels dramatizing their time in the caliphate, to compliment works like “Take Me to Jihad” already inspiring the next generation to fill the ranks of the global jihad movement. What we must understand, as both American and counter-terrorists, is this is a generational fight. America and its allies must understand that the long view of this enemy and its absolute ideology will not adhere to a three-year counter-ISIL strategy or announced time tables. Our approach must be resilient, measured, and holistic, starting with an understanding of who the enemy is and what their ideology tells us. We must also foster strategic partnerships with leadership in the Middle East, specifically Muslim and Arab countries seeking to defeat this foe. Understanding they pose even more of a threat to these countries than the United States, we must facilitate their development of an effective counter-narrative. It will also require a steady, long-term commitment, vast resources, and clear vision beyond the first fifteen years fighting this ideology since 9/11. Anything less cedes the information domain to the enemy and facilitates the proliferation of an ideology inspiring individuals to act and cause chaos worldwide. At the time this article was written, Major Mike Kelvington was an MPA candidate at Princeton University’s Woodrow Wilson School of Public & International Affairs. Raised in Akron, Ohio, he’s an Infantry officer in the U.S. Army with seven deployments to Iraq and Afghanistan, including with the 75th Ranger Regiment. He will be returning to the operational Army later this year. The opinions expressed above are his own, and do not represent the official position of the Combating Terrorism Center, the U.S. Army, or the U.S. Government. Nadav Samin, “A Guest on This Earth: Humam al-Balawi and the Birth of Jihadist Fiction,” The Hedgehog Review, Spring 2017, 90. 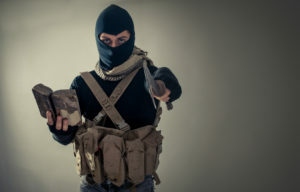 Diego Gambetta and Steffen Hertog, Engineers of Jihad: The Curious Connection Between Violent Extremism and Education, (Princeton, NJ: Princeton University Press, 2016), 160. Bernard Haykel, “On the Nature of Salafi Thought and Action,” in Global Salafism: Islam’s New Religious Movement, ed. Roel Meijer (New York, NY: Columbia University Press, 2009), 33-35. Abdulaziz H. Al Fahad, “Raiders and Traders: A Poet’s Lament on the End of the Bedouin Heroic Age,” Saudi Arabia in Transition: Insights on Social, Political, Economic, and Religious Change, eds. Bernard Haykel, Thomas Hegghammer, and Stephane Lacroix, (New York: Cambridge University Press, 2015), 231-232.